By reason of special factors (which lie beyond the scope of this present exposition), the magicians of the day were a various lot; gathered in colloquy, they seemed an assembly of rare and wonderful birds, each most mindful of his own plumage. While, on the whole, lacking the flamboyant magnificence of Grand Motholam, they were no less capricious and self-willed, and only after a number of unhappy incidents were they persuaded to regulate themselves by a code of conduct. 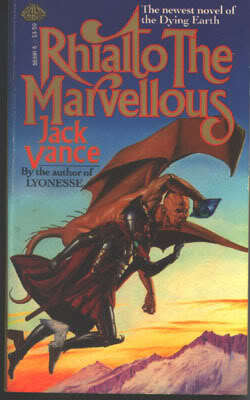 Jack Vance is best known among D&D players for the magic system that bears his name. In his Dying Earth stories, magicians wrestle potent spells from ancient librams into their brains. Fans of Vance’s work attend more to his imagination, his wit, his flair for sardonic dialogue and his spare, elastic prose. The three stories compiled as Rhialto the Marvellous give us a full dose of both categories; the book is chock full of earthy, damaged magicians frittering their lives away beneath a dying sun. Vance’s stories certainly entertain on a sensory level. He sketches portraits of bizarre landscapes with only a few words, many of them obscure, archaic or freshly minted. But while his mastery of language is a great strength, it’s his grasp of character and theme that give his stories backbone. Behind their fanciful names and mannered diction, his characters are authentically selfish, venal and eccentric, and their sparring is both engaging and to the point. The three stories in the collection share a theme; the characters are the vapid descendants of greater generations, and they squander both their talents and their inheritance on inane plots and frivolous pursuits. Vance grew up during the Great Depression and struggled to be involved in the Second World War; the last story in the collection, “Morreion,” was written at the close of the Vietnam War, while the others were written during the “me years” of the ‘80s. Regarding the stories in that context, it’s easy to read the critiques of American society embedded in the text: feminism and gender theory; corruption of the rule of law; the predicament of veterans when the public chooses to forget about the war. Scratch the surface and there’s strong stuff underneath. Aside from the magic—which is, itself, curious and entertaining stuff—and the tales’ thematic weight , I strongly recommend these stories to old-schoolers for the characters. They are the platonic ideal of OD&D PCs: self-absorbed, cowardly, greedy, and dreamily unconcerned with morality and ideology except when such matters impinge on their activities, yet strangely compelling by dint of their surface qualities: wit, eccentricity, verve and panache. If only all of our adventurers were so engaging!